The product junkie in me strikes again (insert evil laugh here)! I know I've said it many times before, but I'm really thinking about settling down product-wise. And if you follow me on Instagram, then you know I'm here for pretty much EVERYTHING Eden BodyWorks is dishing up for the Coconut Shea line. Seriously, can somebody let the folks at EBW know I'm here for every single bit of being a brand ambassador? Aloe Barbadensis (Aloe Vera) Leaf Juice: Acts as a natural conditioning agent that restores the hair's sheen, luster, and shine. It not only makes the hair soft, but it also enhances strength and suppleness. Cetearyl Alcohol: Considered "fatty alcohol" -- NOT to be confused with drying alcohols such as ethyl. Acts as a lubricant, thickener, and emollient. Also give conditioner its velvety feel without making hair greasy. Is additionally used to keep product ingredients from separating. Propanediol: Plant-based, ECOCERT-approved emollient, solubilizer, and viscosity improving agent. As a natural alternative/replacement for propylene glycol, it improves moisture binding activity which results in silky smooth hair. Butyrospermum Parkii (Shea) Butter: Emollient fat from the nut of the East or West African shea nut tree, used to moisturize and soften hair. Cocos Nucifera (Coconut) Oil: Oil high in saturated fats (which is why when cold, it is solid). One of the few known oils to penetrate the hair shaft and truly moisturize hair. 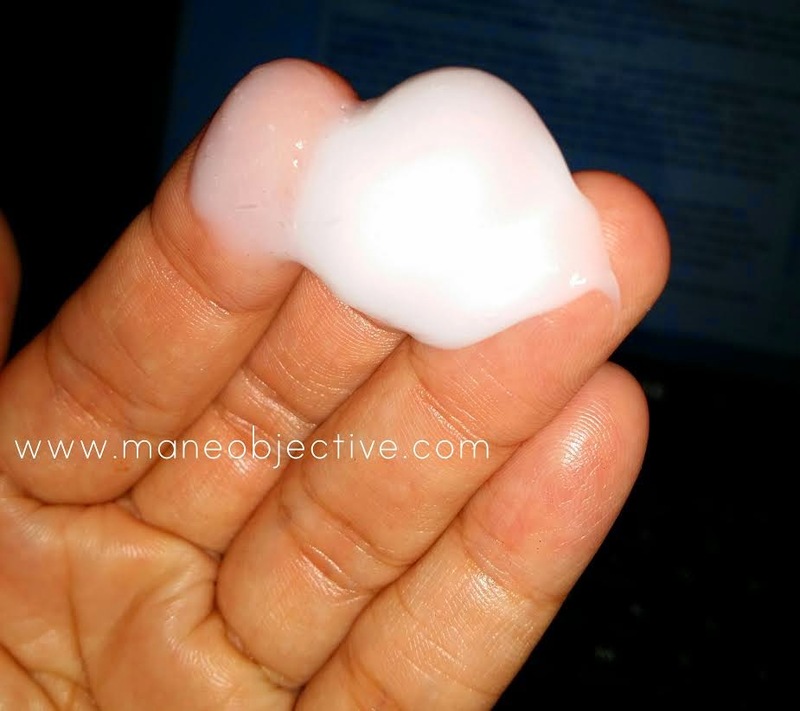 Coconut oil helps to moisturize, seal, and prevent breakage. Availability: The Eden BodyWorks Coconut Shea All Natural Cleansing CoWash is available at all Sally Beauty retailers, and online at www.edenbodyworks.com. Word on the street is Wal-Mart is an option, but I haven't seen it with my own two eyes (at least in LA). And quiet as kept, EBW's owner/founder was at Target HQ last week, and I'm hoping this means the line will start surfacing at everyone's favorite spending trap store. Affordability: Using my Beauty Club Card, I paid $9.79 + tax for the 16oz bottle of product. Bigger jars + less money = happy Christina. Product Claim/Description: Coconut Shea All Natural Cleansing CoWash is a sulfate-free, no suds gentle cleansing conditioner cream for removing residue and build up between regular washings to promote a healthy hair environment for growth. This product was made without sulfates and contains no mineral oils (petroleum), dyes, or parabens, and is cruelty free. Performance/Delivery: Ever since Wen landed in my lap, I've been sketch about products specifically for cowashing. Why not just use regular ol' conditioner, right? I can honestly say that Eden BodyWorks has made me see the error of my ways. I am in LOVE with this product -- so much so that it has officially become my go-to cleanser right now. My hair and scalp feel clean, but in no way stripped. My hair felt soooooooooooooooooooo smooth and moisturized after using it. Better than any shampoo, shampoo bar, or cowash has ever made my hair feel. Period. Those rough ends were a thing of the past with this CoWash. I've been looking for something to help keep my dry ends from terrorizing wash day, and this is the one!!! And the slip? EPIC. See, there's two types of slip in my book -- inherent slip (a product that is slippery by nature or design), and manufactured slip (just add water). This CoWash is inherently slippy. MAJOR slippage. I'm talking instant tangle meltaway, and it doesn't need a constant stream of water to get that way either. I didn't pre-poo (gasp!) or detangle before hopping in the shower, and with the CoWash, my tangles were a non-factor. In fact, I lost less shed hair and saw scores less wispy breakage at the end of my shower -- which means greater length retention! I was able to cleanse and detangle my hair at the same time, which was a total win. The fragrance is heavenly, and consistent with the entire Coconut Shea line with that gently coconut creamy fragrance. There are no artificial colors, so it's just plain ol' white! The consistency mirrors that of most creamy cleansers -- more movement than conditioner, but not as runny as shampoo. Drawbacks: Honestly, I'm having a really hard time coming up with one. The price point, ingredient list, and performance are super solid. Most folks would gripe about the CoWash being in a jar over a pump or squeeze bottle, but I am just fine with the jar. Pumping stuff in the shower gets annoying, particularly as the stash gets low. I guess the only real drawback is that this product is a one-trick pony. It really wasn't designed to be a leave-in, deep conditioner, styler, moisturizer, or anything else. I'm not saying that any of the aforementioned is impossible, just that the CoWash inherently is just that -- a cowash. Even still, the price point isn't prohibitive, so I'm not really tripping. Bonuses: The label won't tell ya, but I will -- this CoWash is Curly Girl-friendly. That's right; epic slip with no cones! Another bonus? Frizz. Banished. This CoWash not only battled back against dry ends, it also helped calm my frizz-prone hair all the way down. What's that you say? Better hair days? Indeed. Bottom Line: If you purchase nothing else from the line, at least give this one a try. You won't be disappointed. 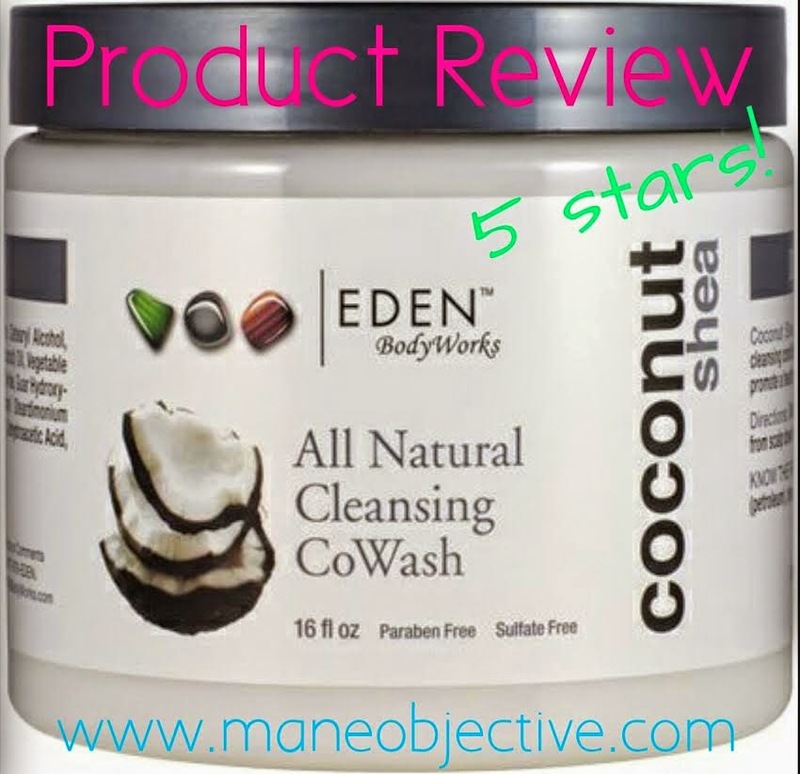 The Eden BodyWorks Coconut Shea All Natural Cleansing CoWash has soared to the top of my favorite cleansers list. It delivers above and beyond what it promises without costing an arm and a leg. Honestly, I've got a question for EBW folks -- how are you all able to keep product costs down and at such a great value? Other brands run around slanging cowashes for double the price and half the size. But I digress. It's a great value and performs better than anything I've ever tried in the cowash department. Worst case scenario -- if you don't like it, return it to Sally's. Best Practices: I love the fact that you don't have to be finicky with this product. I've used it to aid in detangling and pre-poo on damp hair, and I've used it to simultaneously cleanse and detangle while in the shower. It's versatile so really, anything goes. My only recommendation is to cycle in (monthly or so) a shampoo to clarify and give you a clean slate. Too much of a good thing can be bad! Overall Product Rating: 5 stars. Hands down, without a doubt. This product hits all the major points -- it's affordable, accessible, has great ingredients, and delivers a performance that is almost too good to be true. Thank you, Eden BodyWorks. I'm forever a fan!!!! Hi Christina, what is the cleansing agent? I am having a hard time picking it up from the ingredient list. Thanks!! Hi!!! That's a great question. As far as I can tell, there is no stand-out surfactant only ingredient. The fatty alcohols and behentrimonium methosulfate possess mild cleaning abilities :) hope this helps! I LOVE this stuff! I also did the buy 2 get 1 free at Sally's for my daughter's fine, curly hair and have been using it on my very long dry hair. Heaven! Conditioner is not that cleansing and I have honestly had dry wispy ends after every product I have used except this; and I only use all natural. I did try the leave-in as well as the curl pudding, but was not impressed. I switched the leave-in for the As I Am so as not to have all that protein, and I am ecstatic! My ends are still as moisturized as the rest of my hair and I only see that after a trim.